Diamond Edge Figure Skating Club offfers the Learn to Skate USA program to our area's skaters. Learn to Skate USA is the premier skating program in the country and their mission conincides with ours "to provide a fun and positive experience that will instill a lifelong love of skating." The Learn to Skate USA program was created to be the best beginning ice-skating program in the world, and is designed to serve the needs of both recreational and competitive skaters. It is the backbone and feeder system to skating programs everywhere. It's also an excellent base for recreational skaters and the first step to training athletes for the future. 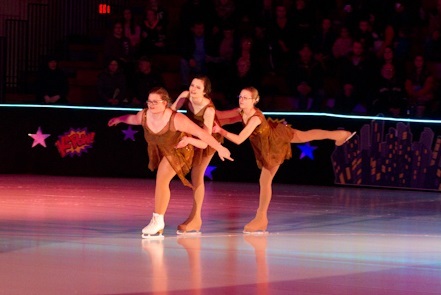 Including specialty programs, designed for skaters who want to explore various ice skating disciplines, include hockey, ice dance, pairs, speed skating, synchronized skating, therapeutic recreational skating and more. Learn to Skate USA program is endorsed by U.S. Figure Skating, USA Hockey, US Speedskating, the Professional Skaters Association (PSA) and the Special Olympics, empowers aspiring skaters to achieve athletic and personal goals on and off the ice while providing a fun and positive experience. The curriculum keeps skaters enthusiastic about learning from the time they begin lessons until the time they reach their goals. To teach children and adults the fundamentals of ice skating while building confidence and skills through each lesson. To provide a progressive curriculum that ensures success from the first steps on the ice to the mastery of advanced skills. To promote the health and fitness benefits of ice skating. To equip each participant with the foundation necessary to reach their goal, be it recreational or competive in nature. Learn to Skate USA makes these lessons easy and fun! Through world-class curriculum and nationally certified instructors, you will be enthusiastic about learning to skate from your first steps on the ice until the time you reach your goals. Whether you wish to enjoy the recreational benefits of skating or dream of Olympic fame, this is the place to start!